“At 47, Lethem is 11 years older than Mailer was in 1959, so he’s had time to get more reading in. 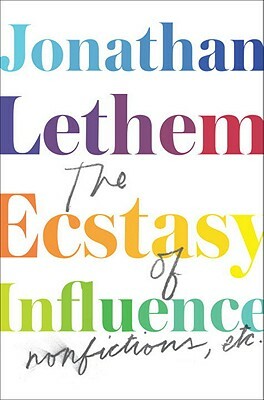 But that’s hardly the biggest advantage of an omnivore who devoured a book a day on the subway in high school and has spent 15 years working in bookstores…” Robert Christgau reviews Jonathan Lethem’s nonfiction collection The Ecstasy of Influence. Sarah Glidden visits Occupy Miami. Keith Gessen on his arrest at Occupy Wall Street. Here’s a combination of writers we like but didn’t expect to see interacting: Mark Bittman on Philip Roth. Richard Nash is interviewed as part of Ploughshares‘ “Innovators in Lit” series. At The Stranger, Paul Constant looks at three works of crime fiction. Follow Vol. 1 Brooklyn on Twitter, Facebook, and our Tumblr.